I think the Masters of the Universe franchise stinks. To me, it’s just a dumbed down mash-up of D&D and Star Wars. Still, there’s no denying its overwhelming impact on the kid world at the time. Do I happen to have an awesome photo of a youngster holding the sword and shield (and wearing the belt) from one of these HG sets? I do. 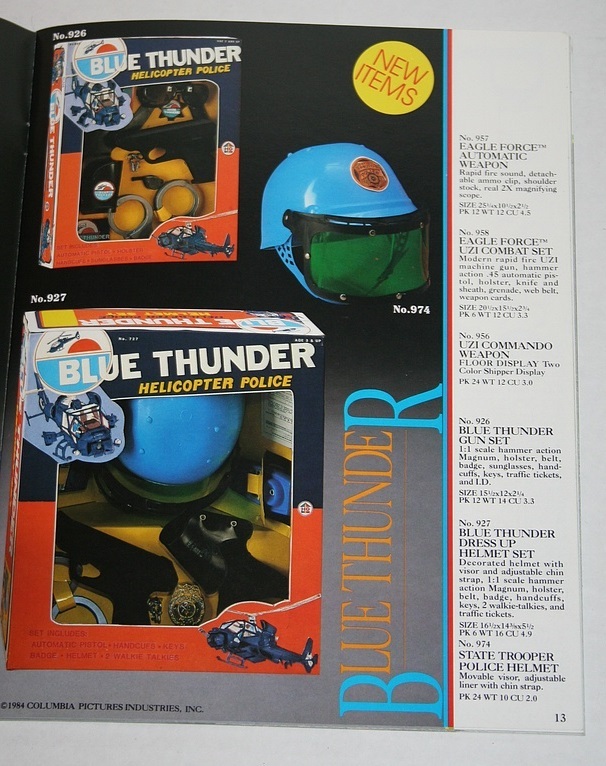 There was a Blue Thunder toy line produced by Multi-Toys, for some reason, but I believe only the helicopter made it to the shelves. Leave it to HG to jump on the scraps: Blue Thunder Dress Up Helmet Set? 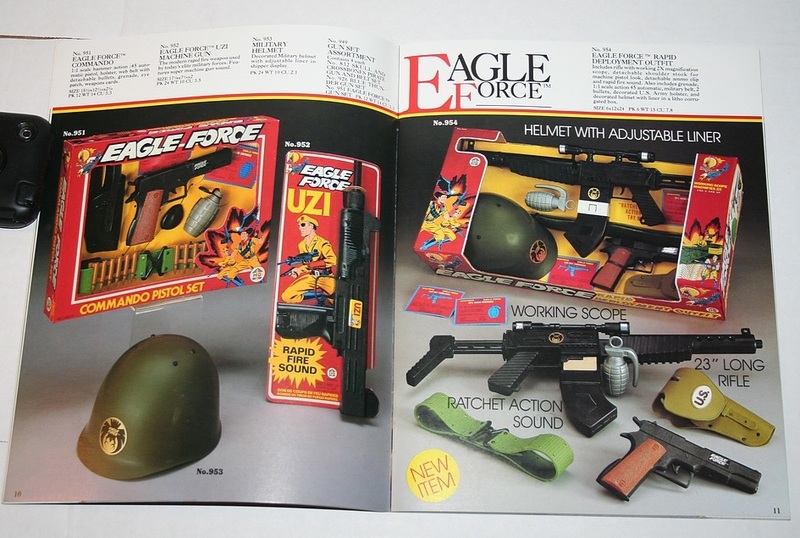 Eagle Force was an action figure line released by Mego in 1982, the same year G.I. Joe: A Real American Hero premiered. (I’ll delve into the two lines at some point, because it’s clear that Hasbro ripped off some of Mego’s designs). Mego shut down operations in 1982, and Eagle Force was done, so it’s curious to see the name still being used in ’84. The Last Starfighter Target Set is so incompetent that I sort of adore it. Is that supposed to be Grig on the right? Mercy. Agreed. Heman ain’t nothing but a ripoff…of even Conan too. Have you seen Remco’s Conan action figures? They’re bad in a fun way. I’ll post some of them soon. All I will say is that Roy Scheider is way cooler than some ‘roid raging doofus with a page boy hair cut. Two votes against MOTU??? I’m shocked and… so very pleased. Not just the haircut and the amazing body, don’t forget about the furry “shorts” and harness. Add it all up and it sounds like one of the descriptions of my co-workers regular Saturday night West Hollywood clubbing stories. 2W2N, on the Last Starfighter box, I’m thinking Lord Krill or some other random enemy soldier. They were all decked out in red. 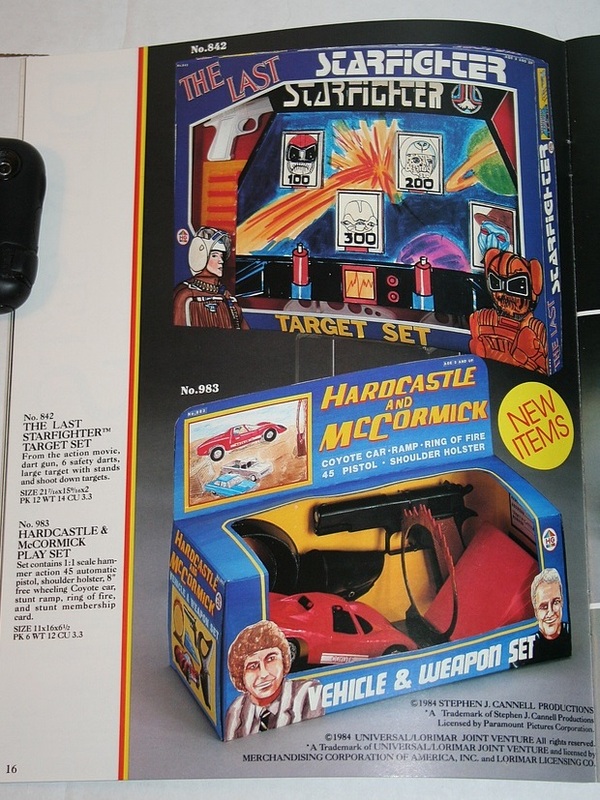 Good god, a Hardcastle and McCormick “vehicle and weapon” set? Did they make Tenspeed and Brownshoe action figures, too? Stephen J.Cannell really does spell Satan backwards. I know I’m about a year late from this post, but it’s funny how this one’s in February again and dealing with MOTU. I’m just saying that because I’m 8 months older than He-Man, being born in February and MOTU debuting in October of 1982. Yeah, I had the light up sword and the box of role playing stuff. I loved those toys so hard that they eventually broke and were left in the yard or sandbox for the weather to claim. If you’re not an MOTU fan, I get it. Gary Goddard, the director of the 1987 movie, even admitted to ripping off Jack Kirby’s New Gods and even wanted Kirby to do the designs for the movie. That would’ve been epic considering all the other big names who have done official MOTU art. On a side note here, I’ve got a picture my dad shot of the Coyote when we went to MGM Studios in Florida back when I was ten. I used to watch “Hardcastle and McCormick” with my dad along with stuff like “Magnum P.I.” and “Simon and Simon”, but the Coyote was the effin’ coolest car out of all of them. Considering today is now officially Tuesday, I think I’ll go ahead and post it to my own nostalgic show-and-tell on my dA page. 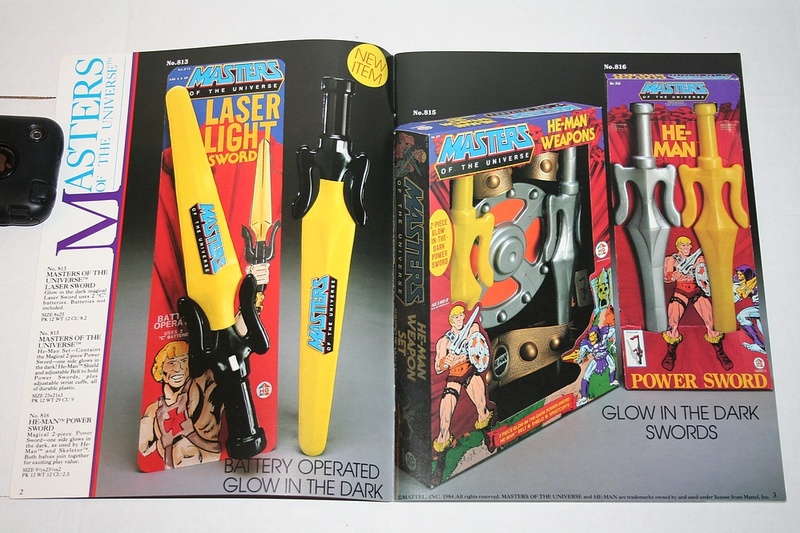 Still, what I wouldn’t give to have any one of those He-Man weapons MOC!